There’s a clear link between foreign language learning and culture learning. From simple, everyday things, like forms of address to appropriate ways of expressing disagreement, culture forms an integral part of the language learning curricula. In any case, in order for communication to be successful, language use must be associated with other culturally appropriate behavior, not only linguistic rules in the narrow sense. However, in the classroom environment, it is difficult to incorporate the cultural frameworks and nuances of the language and how it’s expressed. Our traditional linguistic approach of teaching Spanish is often based on provided-textbooks, and fails to reveal the multi-faceted nature of language. Exploring Spanish Cultures in New York City, is a Civic Engagement assignment designed to address this issue. The students will be conducting an interview with or report on a Hispanic organization, business, community, or individual to learn about the subject’s cultural identity, experience, and stories. The reports, with the subjects’ consent, will be shared with the public on the blog to bring awareness of Hispanic and Latino communities in New York City, which make up 27.5% of the population. This assignment considers storytelling as a practice that bridges cultural and civic engagement, and your participation is essential for it. 1. Find a subject: Your subject may be a salsa dance school teacher, Spanish/Latin American restaurant owners, community centers for Spanish native speakers, or simply a person who has experienced both American and Spanish-speaking cultures. You can use Google or yelp to find more options. Here are great sources (click on the links) to find an interesting subject for your report. *Please notify your subject that this is a college course assignment, and it will be posted on a blog as a report (Unless permitted by the subject, the name will be omitted on the site). If the subject does not agree, you have to find another person to do a report on. take a picture of either the subject or the environment that speaks of the subject’s culture. What brought you to this country? Was it difficult to meet new people, friends, contacts, etc? How do you keep your culture alive? What do you do with your family that is specific to your culture? Was your accent an obstacle to your career as a professional here? 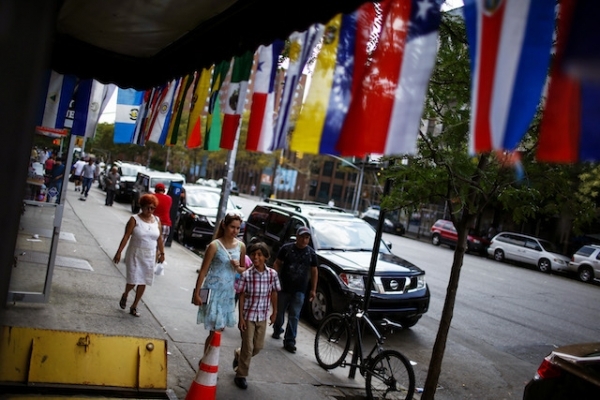 Do you think we have competitive disadvantages or advantages being a Latino in the U.S.? What is a political issue that you are concerned about today? What identify you the best: Latin American, American, New Yorker, Brooklynite? What would be your advise to young Latino starting out in the U.S.? And be curious! Ask any questions that you may have of your own. The interview may be in the form of video recording (no more than 10mins) or in writing. If you are submitting a written report, use a audio recording device (you can use your phone) to record the interview, and then transcribe it afterwards. If you are video interviewing, post your video on Youtube as a “unlisted” video, and email me the link to the video with your report. Students will start at the beginning of the semester and the report is due no later than the day of the final exam. Finally, the students will write a reflection essay, in which they will provide a combination narrative explaining how these external experiences and interactions with the Spanish community in New York City, has enriched and expanded their knowledge of Spanish language and culture. Students will state what they have learned through this multi-faceted interactive approach of learning Spanish outside the confines of a traditional linguistic setting-one based on provided text books, and only centered in a classroom environment. They will also reflect on how this “new revelation of other realities” have raised in them a new sensitivity and sense of social responsibility. These experiences will eventually lead them to recognize the importance of engaging, in an active and altruistic way, in this multicultural society we all live in.